By Travis - Peru - 31 May/03 - Viewed 1749 times. After returning from our Alpamayo trek, we took a day to relax and fatten up. The next morning we took a tour of the archeological site of Chavin de Huantar, normally a couple of hours by bus from Huaraz. However, the trip was lengthened considerably by road improvements over the mountain pass (at one point we sat in the minibus for a little over an hour during a period of tunnel construction that couldn't be interrupted--there was no alternate route). After we arrived in Chavin and had some lunch, we got started with the tour. The Chavin people were Peru's first major culture, believed to have lived in this area from 1300 to 400 BC. The ruins consited of a couple of ceremonial plazas with seating areas around the perimeter, a stone approximately the size of a small car that had seven troughs carved into it (which, when filled with water were reflecting pools for astrological observation), a temple with underground chambers where the Lanzon de Chavin (a stone idol about ten feet tall), and a network of small underground rooms where nobility and the priesthood lived at certain times. Several areas of the site had intricate carvings, and our guide, Fredy, explained the significance of various details. The cat was one of the gods of the Chavin. The main ceremonial plaza is located over a riverbed rerouted by the Chavin people, and has a network of canals running beneath it. In one corner of the plaza, there is a set of several stone-lined holes leading from the surface to one of the underground canals. During the ceremonies, extra water was allowed into flow through the canal, causing roaring, catlike noises to come from the holes throughout the ceremony. We had hoped to take another tour the following day to visit Pastoruri, but there weren't enough people for the trip to go. We spent the day reading, doing e-mail, etc., etc. and took the tour the next day. The first stop on the tour was at a natural spring that emitted carbonated water--I didn't catch the explanation of how this was possible, but people were drinking it like club soda. We made a couple more stops to see a colorful sinkhole filled with water and a few petroglyphs alongside the road. We then arrived at Pastoruri, which is (I think) one of the highest areas in Peru accessible by road at 5000 meters above sea level. About half of the group was visibly having difficulties breathing comfortably at this altitude, a condition that was not helped by the walkway being paved with bumpy, lumpy fieldstones that were set in the pavement at all angles. After walking (stumbling and panting) for two kilometers, we came to the end of the trail and the start of the snow. I walked across the snowfield for another 45 minutes (occassionally breaking through the crust and sinking to my knees or better), until I reached a stone ridge rising out of the snow. A short scramble to the top of the ridge allowed nice views of the Huayhuash Range of the Andes. We arrived back in Huaraz around 7:00 that night after the Pastoruri tour, ate dinner and boarded the night bus to Lima at 10:00. The trip was a nightmare, trying to sleep as the driver (aggressively) negotiated the mountain roads descending from 3500 meters to the coast. Arriving in Lima at 5:30 AM, we took a taxi to another bus station, and were on our way to Ica by 6:15, arriving there at 10:30 AM. After hiking across a snowfield at 5400 meters, it was quite a change to arrive in the desert town of Ica, surrounded by sand dunes several hundred feet tall. We took a cab to the nearby village of Haucachina, found a hostal and tracked down information on sandboarding (our new favorite "sport"). 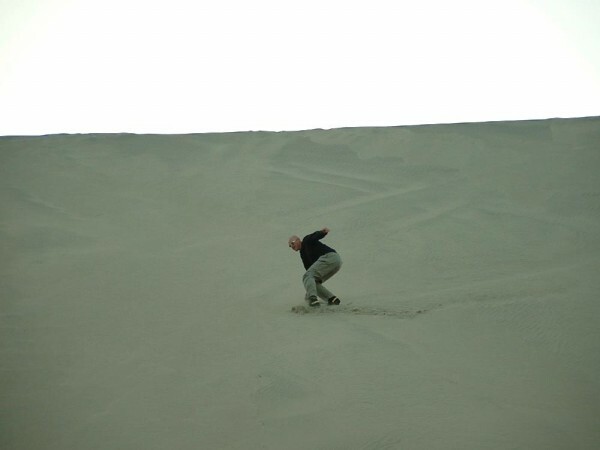 It is similar to snowboarding (the board is a little shorter), but dune buggies drive you to the top of the dunes, you wax the bottom of the board, strap your feet in and zip down the dunes. We made five descents, one of which was extremely steep and we laid face-down on the board and went insanely fast, straight down the hill. Probably just as exciting as the sandboarding was the buggy ride, up and down, around and around--they really gave us our money's worth. The drive back to Haucachina over the dunes was in the dark (but still wearing sunglasses to keep the sand out of our eyes, more or less), which added another level of adventure. We went back to Ica for dinner and had a tasty Italian meal at Restaurant Venezia. The next morning we took the bus to Nasca (two hours) to see the famous Nasca lines. These are large drawings made on the desert floor by removing the darker rocks on the surface to reveal the lighter stone below (sort of like an Etch-A-Sketch of gargantuan proportions). They were made by the Nasca people who lived in the region from 200 to 800 AD. Although the Nasca people made them with advanced mathematics and surveying techniques at ground level, you can only view them properly and get some idea of the overall design from the air. As the tickets were a little dear ($40) and the flights notoriously bumpy as the pilot banks the plane drastically to allow the passengers to see the designs on the ground through the side windows, I took the flight alone. In addition to a plethora (yes, I just like to say "plethora") of geometric patterns, there was a monkey, dog, condor, spider, whale, tree, hands (five fingers on one, four on the other--the reason wasn't explained to me, at least not in English or Spanish that I was aware of), and a couple of birds. It was interesting, but if I could have the $40 back, I'd probably just admire the posters at the tourist office. We are off to Arequipa by overnight bus in a couple more hours.